If you go down to the woods today…. you won’t find a teddy bear’s picnic ! wielding some state of the art forestry equipment and implementing cutting-edge forestry management courtesy of English Woodland Timber’s Forest Management team. Now, these machines are seriously advanced bits of kit… and they’re not toys at all… but as you can see.. they are BIG. Yogi operates the Harvester. 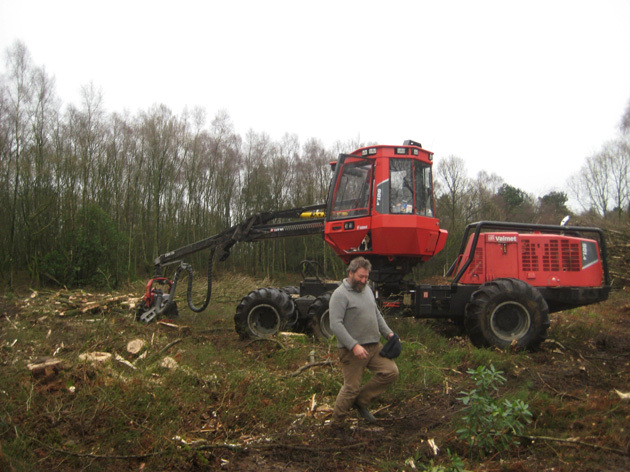 This machine does what it says on the tin… it harvests trees. It does that by gripping the tree at the base, it then saws it off, controls it’s fall, runs the timber length through the head taking off the limbs (measuring and feeding data into the onboard computer as it goes). It saws off the top & then runs the timber length back through the head, cutting into set lengths as selected by Yogi based on the information supplied by the computer. 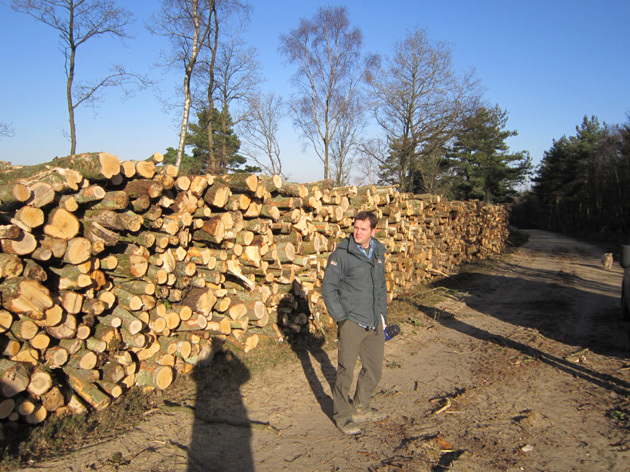 The end result: nice neat stacks of timber set out by product type (sawlog, fencing, woodfuel) ready for extraction. I’ve worked with guys who were trained to fell trees with axes and cross-cut saws, not that long ago really, so things have moved on quite a bit…. oh, did I mention that Yogi’s harvester has a self-levelling cab (for when he’s on steep banks), and a built in fridge and pie warmer. Bruce operates the Forwarder. This is a massive tractor sort of thing that picks up the timber left by the Harvester. It grabs and loads it onto the bed at the rear, taking up to 12 tonnes of timber at a time. Like the harvester this machine is built to travel over seriously difficult terrain. 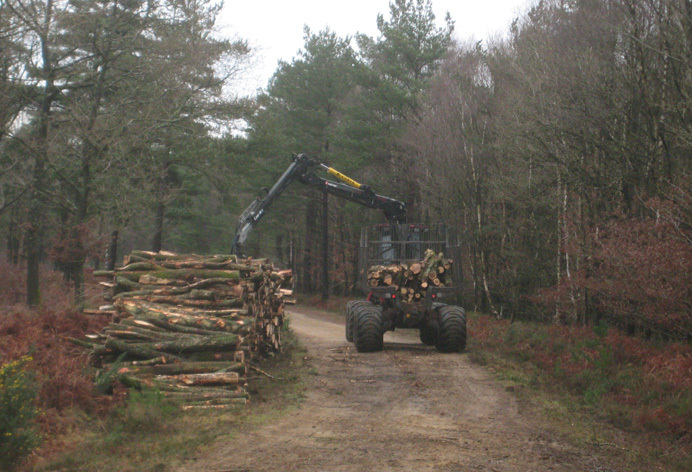 Bruce then takes the loaded Forwarder out of the harvesting stand (the forest) to where a timber lorry can pick up the wood, where he stacks the timber in lovely neat stacks. 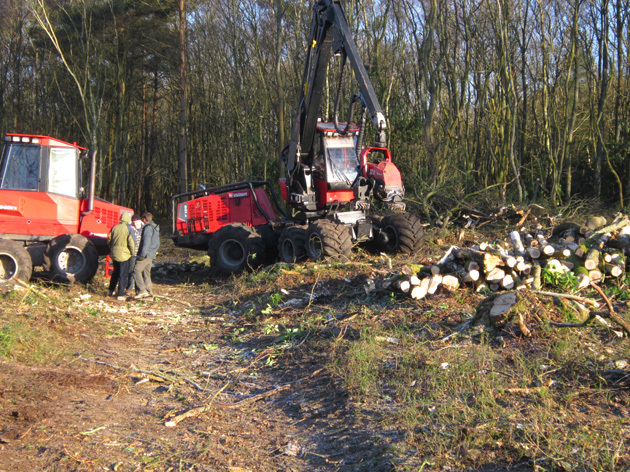 In the hands of experienced and skilful operators like Bruce & Yogi these machines can get up to 70 tonnes of timber from standing tree to roadside stack in a single day. 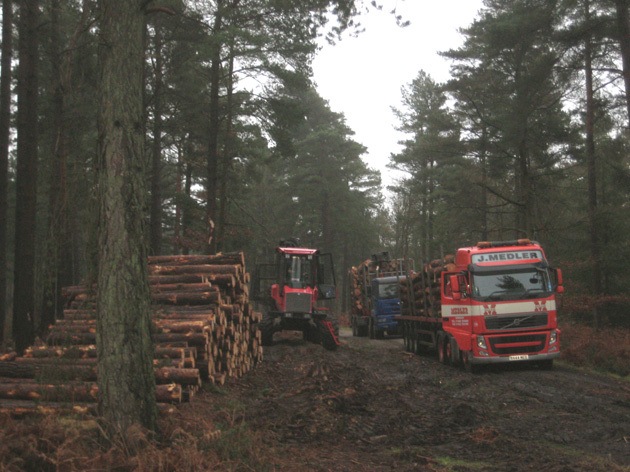 For a number of years we have been providing a forest management service to the owners of 1500 acres of beautiful and productive pine woodland in Surrey. Quite a bit of timber has come out in that time, much of it at the hands of Bruce & Yogi and most of it from thinnings – where we remove a proportion of the standing crop leaving more space for the better trees to grow on (see below). 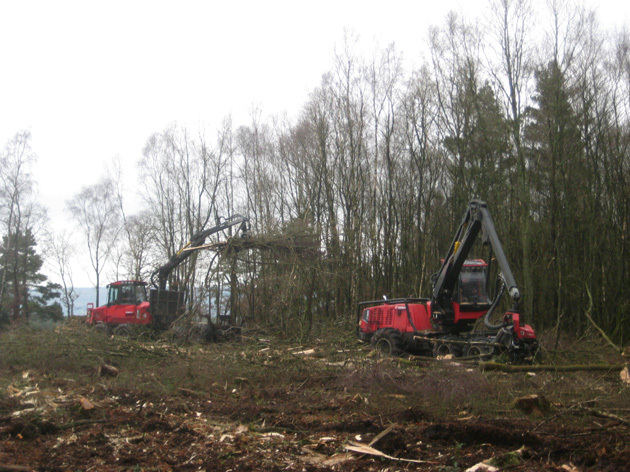 On a site as big as this though clearfelling (taking all the trees off an area) is inevitable in order to harvest crops and provide open sites for the next generation of trees to grow. 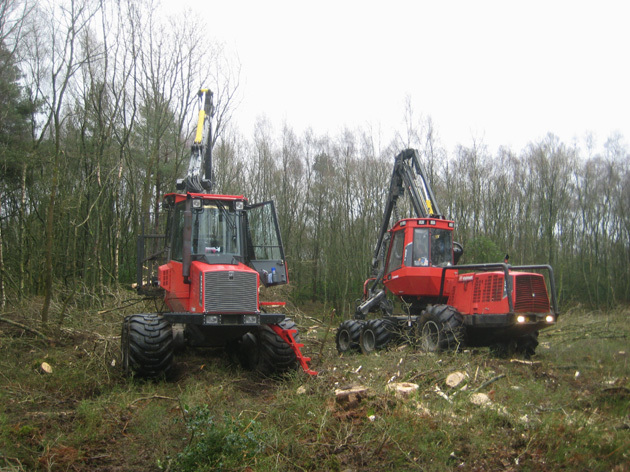 Once the harvesting gang have moved off we need to bring another big machine on site to clear the arisings (branch wood and tops) in order to allow the young trees to establish and grow. 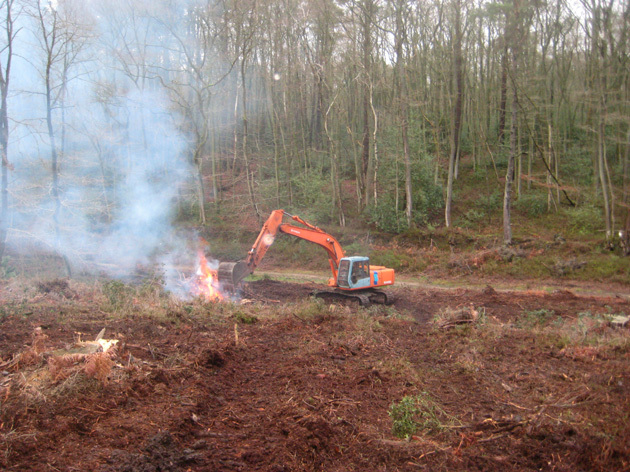 In this case Mark has his 18 tonne 360 excavator on site and is raking the arisings into piles before burning them. The raking has the added advantage of slightly scarifying the ground, which enables better regeneration of young trees. The burning is done in a controlled way, which is preferable to leaving the material in piles as a temptation for the local yobs to set fire to the forest when it’s to dry to burn safely. I feel quite feeble when I get my chainsaw out the day after I’ve been to see these boys in operation, but the chainsaw is still the vital piece of forestry kit, as you’ll see in future blogs…. This post was written by Andy Wright one of our chartered Forest Managers. Andy studied Forestry at University College of Wales Bangor http://www.bangor.ac.uk/senrgy/ gaining a higher second class BSc Forestry Hons. Born and raised in East Sussex his family still farm at Blackboys. 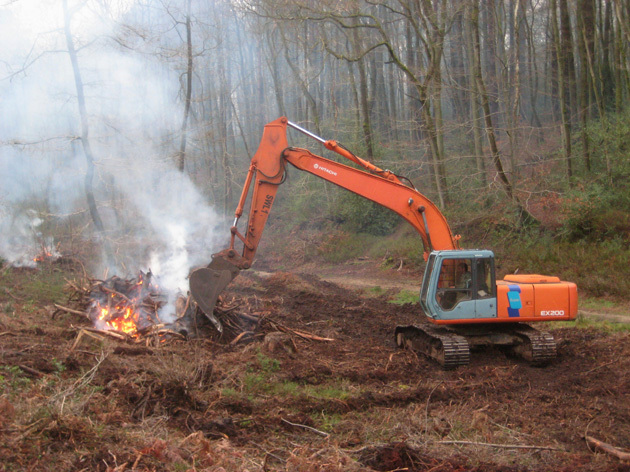 Andy spent seven years as a Woodland Officer with the Forestry Commission helping owners in Surrey and South Wales. He also recently gained full membership of the Institute of Chartered Foresters. 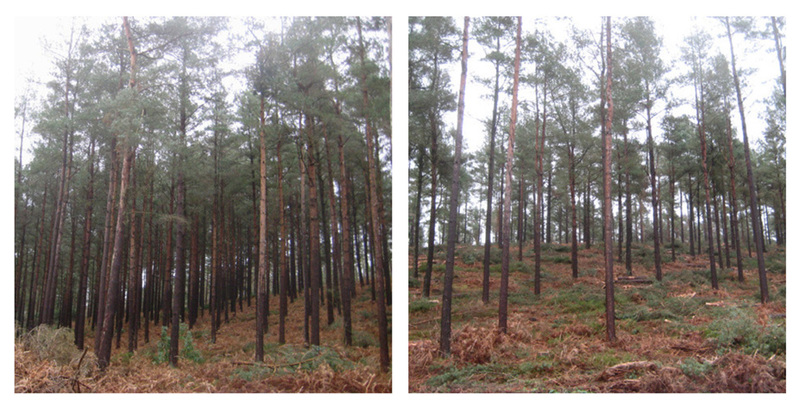 Posted on February 20th 2012 under round timber, woodland management, woodland products. You can follow any responses to this entry through the RSS 2.0 feed. You can leave a response, or trackback from your own site. Cool! They need one of these at Diggerland!